Top Quality Czech Glass Pearl Round Beads 3mm 4mm 6mm 8mm 10mm 12mm 14mm 16"
Toho seed beads are high quality Japanese seed beads. They are manufactured to a very high standard and are more consistent than cheap seed beads, leading to a neater finish to your work. Your beads will be supplied in a fully labelled re-sealable plastic tube. Rhinestone Clay pave Shamballa Style Round beads with approx 56pcs A grade pp11 Rhinestone. Colour: Light Topaz. Size : 8mm. Quantity: 10 Beads. 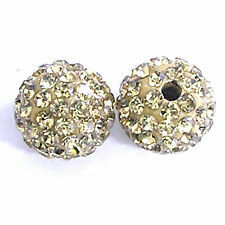 Rhinestone Clay pave Shamballa Style Round beads with approx 56pcs A g rade pp11 Rhinestone. Colour: Topaz. Size : 8mm. Quantity: 10 Beads. 20 8mm turquoise / topaz mixed glass Czech fire polished beads. Imported from the Czech Republic. Beautiful beads to use in jewellery making. 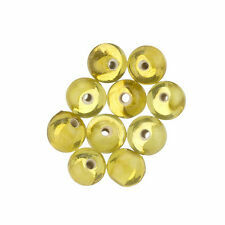 Our amazing deep topaz yellow glass beads are perfect for off loom and bead weaving jewellery designs. These Indian glass beads are handmade, creating a varied effect within the collection of beads. 20 8mm topaz Czech glass fire polished beads. Imported from the Czech Republic. Beautiful beads to use in jewellery making. Best selling 6 ~10mm South African Blue Topaz Gemstone Round Bead 15 "AAA"
AA QUALITY LONDON BLUE TOPAZ MYSTIC QUARTZ drop beads. These glorious beads have an even shape and colour. We have more beads listed. Beads cracked glass for making jewelry, round shape, size: 6mm, hole diameter: 0.8 mm! Discount and shipping within 24 hours!. Top Crystal Glass Round Glitter Inside AB Coating Beads 6mm 8mm 10mm 12mm 15.5"
Pearls round faceted Crystal Necklace of pearls, bracelets, earrings. Size: 8mm, diameter hole: 1 mm! Discount, shipping within 24 hours!. Top Crystal Glass Round Matte Frosted Inside AB Beads 6mm 8mm 10mm 12mm 15.5"
They are translucent brown color 8mm glass beads that have teeny tiny "smoke topaz" color rhinestones glued into tiny indentations in the beads. We estimate there to be an average of about 3 or 4 loose stones per bag.